Hafod, one of the most important naturalistic picturesque landscapes in Europe, lies in the remote upper Ystwyth valley some 15 kilometers inland of Aberystwyth. It was here in the late 18th-century and early 19th-century that Thomas Johnes built a mansion and set about improving the estate. Pioneering work in upland forestry and experimental farming and animal husbandry was much admired, but it is Johnes’s picturesque landscape work for which he is now best remembered. He established several long walks, which linked natural features such as waterfalls, cataracts and view points with bridges, summer-houses, grottos, and a cold bath and allowed the walker to view the landscape in a series of ‘pictures’, hence the term picturesque. Following Johnes’s death, the picturesque elements of the landscape were neglected and most eventually fell in disuse. 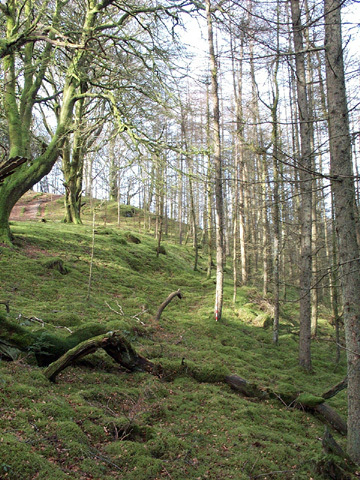 Extensive plantations were made by the Forestry Commission. have been involved in building recording, GIS database compilation, survey and excavation. In the late 18th-century Thomas Johnes constructed the Lady's Walk, the first of his picturesque walks at Hafod. For most of its course the walk is still readily traceable; some lengths have been restored and opened to the public. At its highest point, however, where it crosses a rocky ridge called Cefn Creigiau, the line of the walk is unclear. Here the only contemporary description of the walk is by George Cumberland, writing in 1796: 'Entering the brushwood, a rural path-way now carries you speedily to a very delightful promontory, rather clear of wood; whence, with a gentle precipice below, you command the crescent formed farm-yard, crouching under the hill, below the river, the bridge, and all around the variegated vale'. Up to 1996, views from the ridge were restricted by a forestry plantation, but clear-felling re-opened the fine panoramic views seen by Cumberland and his contemporaries, and revealed topographic features hidden beneath the closely planted trees. 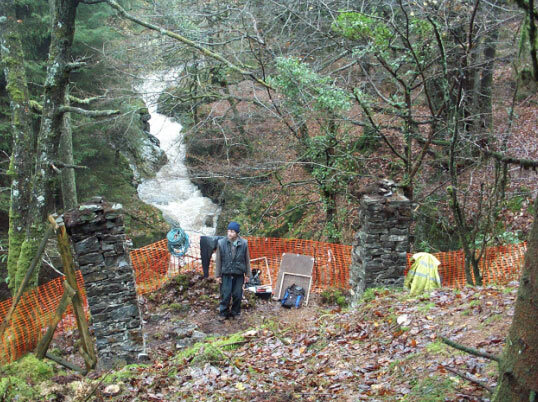 Dyfed Archaeological Trust were commissioned by Forest Enterprise and Hafod Trust to undertake a detailed topographic survey to assist in determining the former line of the Lady's Walk and to aid in planning a sympathetic land management plan. In the course of the survey it was discovered that very little evidence for the line of the walk survives. In a couple of locations slight earthwork terraces may indicate its position. Several candidates for Cumberland's 'delightful promontory' were identified. Thomas Johnes had constructed these two bridges by 1795. Both are single-arched and stone-built. Pont Dologau is a particularly elegant structure with its 8m wide arch spanning a narrow gorge high above the Afon Ystwyth. The parapets of both bridges were removed in the late 20th century to facilitate access for large forestry lorries, but both have now been closed to heavy traffic for some years. In 2001 timber parapets were constructed to make the bridges safe for pedestrians. Photographic recording of the bridges was undertaken before, during and after construction of the parapets. The project was financed by Forest Enteprise. This was the main walk on the south side of the Afon Ystwyth with a circuit length of 5.7 km and a starting and finishing point at Hafod Mansion. Thomas Johnes had constructed the circuit by the late 1780s, and it became a favourite subject for artists and writers. Although parts of the walk seem to have been abandoned in the early 19th century, sections of it, such as that leading up to the Cavern Cascade, an artificial cave in which a waterfall can still be viewed, never completely fell out of use. Coniferous and deciduous forestry established over large tracts of the southern valley sides in the 20th century further obscured the walk and its associated features, such as viewing platforms and bridges. Forest Enterprise and the Hafod Trust commissioned a detailed topographic survey from Dyfed Archaeological Trust in 2001. The survey not only recorded the known elements of the picturesque landscape, but also was successful in locating many lost features. The survey and accompanying written descriptions and photographs will inform Forest Enterprise and the Hafod Trust's restoration and conservation programme, which is currently in progress. This detailed topographic survey of two forestry covered ridges and meadow lying between them was funded by Forest Enterprise and the Hafod Trust and was undertaken in the spring of 2002. The survey was hampered by a dense under-storey of rhododendron and by areas of wind-blown conifers. Several important elements of the picturesque landscape lie on the ridges including: Mariamne's Garden, established in the late 18th century for the daughter of Thomas and Jane Johnes; a summer house and viewing platform; and a monolith, said to be the location at which Mrs Johnes and her daughter watched the mansion burnt down in the early 19th century. In addition to these known sites, several new landscape elements were discovered during the survey, such as the courses of previously unknown paths and viewing platforms. The survey and accompanying written descriptions and photographs will inform Forest Enterprise and the Hafod Trust's restoration and conservation programme, which is currently in progress. 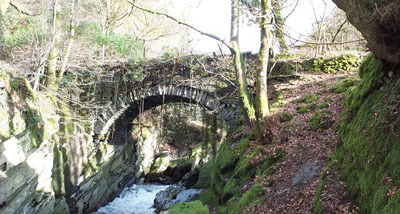 A small 19th century structure now known as the Gothic Arcade lies on the edge of the narrow Ystwyth gorge. The picturesque late 18th New Walk, laid out by Thomas Johnes, passes the front of the structure, and fine views up the Ystwyth are gained from it. 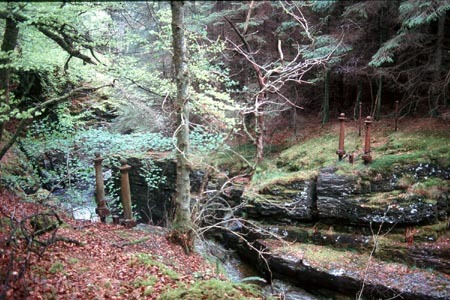 Only two masonry piers survive; these were to be conserved by the Hafod Trust/Forest Enterprise Partnership. These were recorded. One pier was leaning dangerously and had to be dismantled and reassembled. Below ground remains discovered during the recording showed that the Gothic Arcade was originally a three-arched structure, as shown on a 1939 painting by John Piper, the only known illustration of the site. Enough evidence survived to indicate that the structure had been a summerhouse not just an eye-catcher. Dyfed Archaeological Trust has had a long association with Hafod and we are always eager to return to this spectacular part of Wales, even if, as in 2007, it’s only for a day in the spring and a day in the autumn. In the spring we were asked to survey the mansion cellars. These are now only accessible through a narrow hole in the rubble of the demolished mansion. Health and safety was a major consideration, and we had to be continuously accompanied by a confined spaces engineer. Despite difficulties we were able to obtain a ground plan of the cellars. The Hafod Trust has not yet decided if and how to restore and maintain the small, rocky garden established by Mariamne, the daughter of Thomas and Jane Johnes, in the late 18th century. In order to inform possible restoration we were commissioned in the autumn to investigate the course of several garden paths. 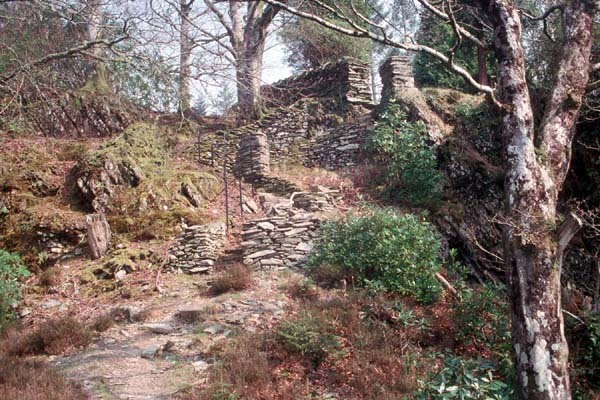 In contrast with other walks on the estate, the garden paths were found to be made from crushed quartz, and would have contributed sparkle to this mountain garden.